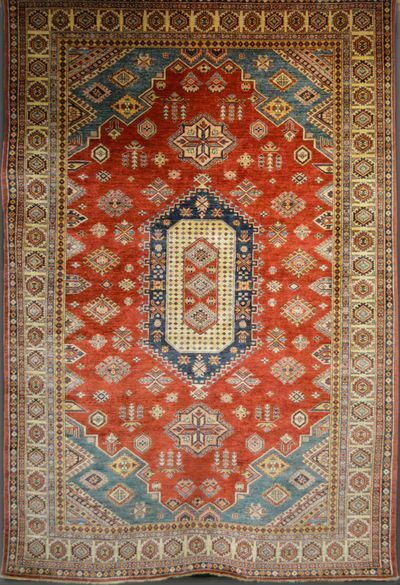 Chah Kazakh: 10'1" x 6'11"
Size in feet10'1" x 6'11"
Hand-knotted in Afghanistan, this brand new tribal rug features the striking geometry and unexpected patterns distinctive to weavers from the central Asian region. A variety of regional influences converge in the vibrant fiery hues and ornate geometric motifs covering this one-of-a-kind piece. This exceptionally fine wool rug has a charming m閘ange of styles and symbols that make it truly unique statement. In origin, Kazakh is a tribal name, now a town, river and district in the extreme west of Azerbaijan, the Caucuses. Kazakhs; also known as Qazax, Kazak, Kasak or Gazakh; are noted for their coarse, long-pile carpets with shiny wool, dramatic colors and vigorous designs. Their knots are usually Turkish (Ghiordes knots) and are generally made by weavers who were Turkic nomads, now settled, who came to the region at the time of the great westward migration of Turks in the eleventh century. These carpets were usually made by the women in the families. Kazakh carpets made at the beginning of the 20th century have colors that are synthetic and designs that are less varied and more simplified as compared to the ones made today. Carpets of this period however still offer good resistance although they are less appealing from an artistic point of view. Today there is a large production of new Kazakh carpets in Pakistan which are inspired by Caucasian designs and are made up of lively colors that are from natural vegetable dyes. These carpets are long lasting and have a short pile. Kazakh carpets blend equally well in classic environments as they do in contemporary settings.